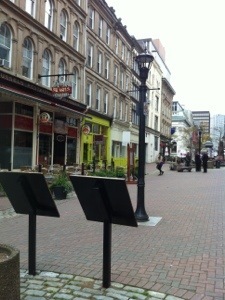 Granville Street in Halifax has some sort of inexplicable charm at any time of year. Come Fall, gone are the outdoor patio settings that most of the eateries eagerly roll out when the sun is blazing and the beer pitchers are a welcome sight for thirsty restaurant patrons. Before stopping to take this photo, I walked through a cloud of pleasantly harmful pipe tobacco smoke that briefly took me to a time where my Grandfather always seemed to have a brier going. Or a time when an Uncle insisted he was down to only “one pipe a day”. A few days before, Art and Design students had placed a giant ship model made out of badly rusted sheet metal and wire out for display. If art can be widely interpreted, then my interpretation of the piece was that you can make dent marks in old metal and make it look like a masterpiece. Should have taken a photo of that while I thought of it. The stands in front give the illusion that perhaps 2 members of a string section are about to come and set up to rehearse something for an upcoming classical music performance. To the left of the Neon green paint of a local tea merchant is the Brussels Restaurant & Brasserie. It is an easy walk to where I spent most of my day job work day, so I can call it a favourite place to spend a few minutes of peace. Any time I have lunch there I order the same thing while looking up at the impressive rows of Scotch, wondering which one will go best with a gourmet chicken salad sandwich. On Friday’s a brilliant guitar player runs through arrangements of Motown and other classic songs to the delight of patrons and staff. The Fall has brought Granville to the annual slowdown it is used to. Suits and Slugs pass through, and a handful of cruise ship passengers trip on the brick streets attempting to figure out who was the person with the lackluster masonry skills relegated to building this section of street. A slight breeze, easily passing through between the buildings, is a reminder of the season current, and a reminder of the season to come. Posted in Notes from the Frogpond.Tagged bar, beer, Brick Street, fall, Granville Street, Halifax, illusion, masonry, Noon, Nova Scotia, patio settings, pipe, Scotch, season.